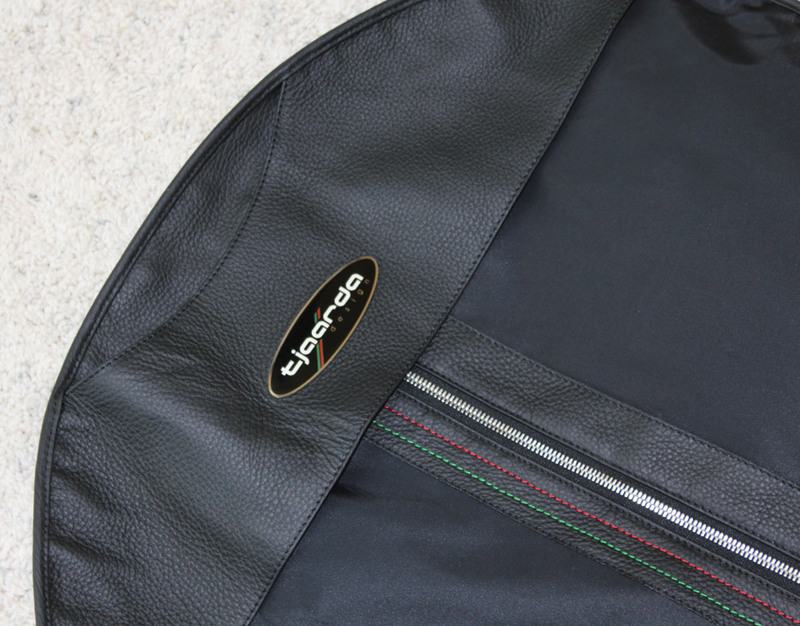 From the designer of the DeTomaso Pantera and many other automobiles comes this exclusive line of leather goods created with the Pantera owner in mind. 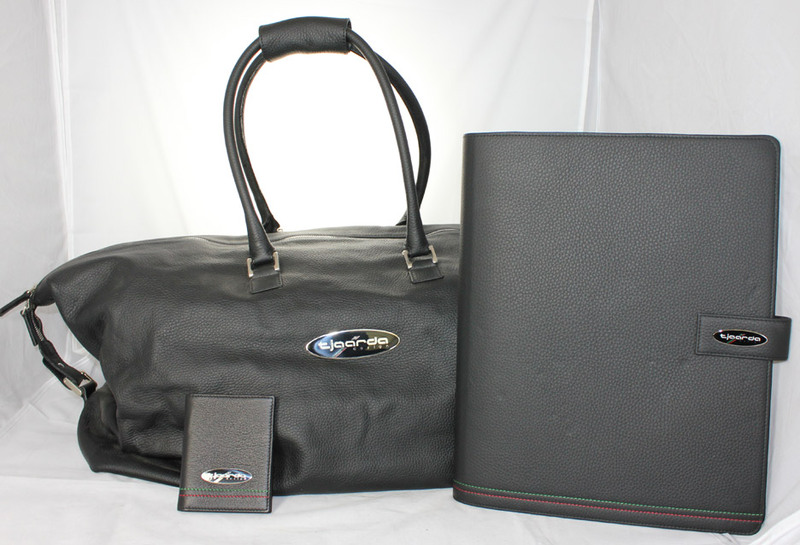 Ever secretly admire the high-end leather goods that Ferrari, Maserati and Bentley owners have for their cars? 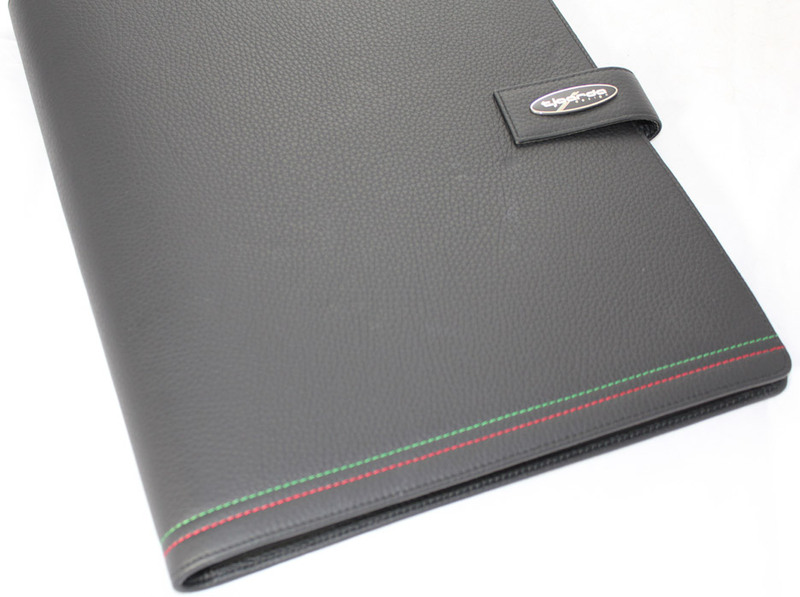 Check out these limited edition leather goods made by the same people that hand-craft them for Ferrari. 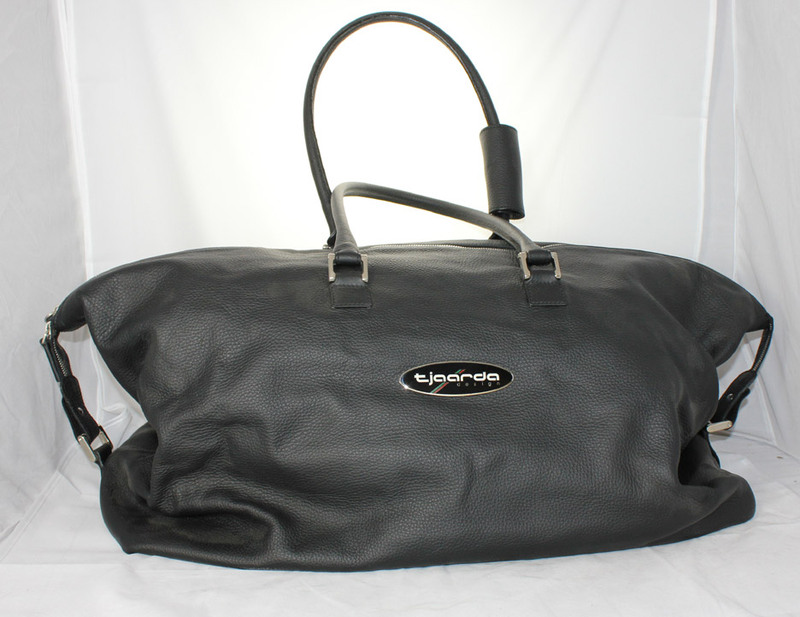 Above: Soft-sided valise or carrying bag: $175.00. Wallet: $75.00. Notebook: $95.00. 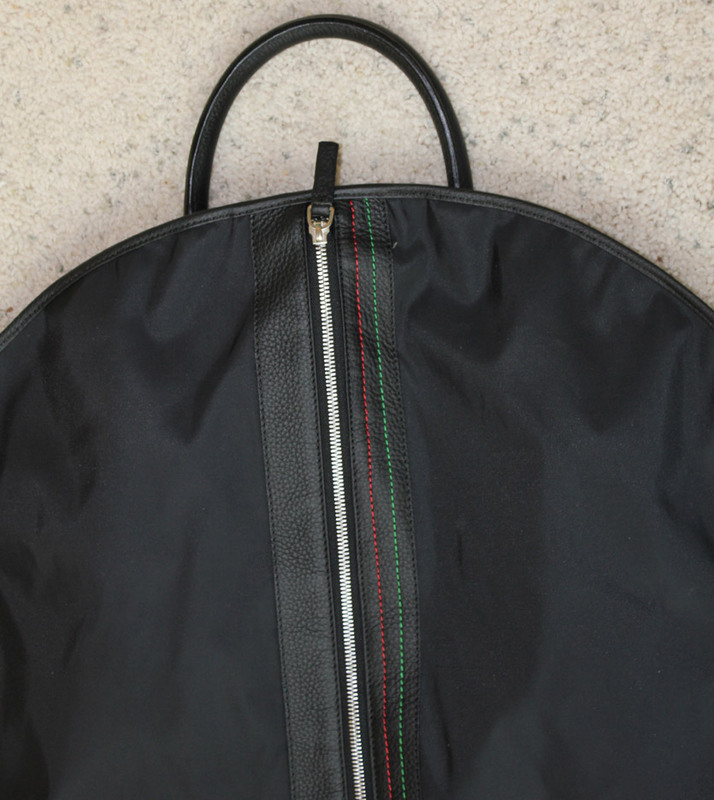 Shown below is the matching garment bag for $150.00. All items are made to the design and specifications of Tom Tjaarda. 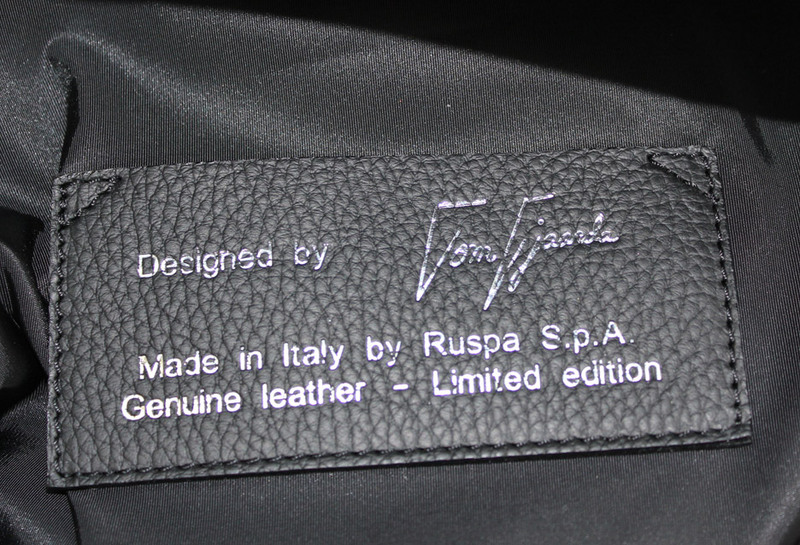 Made in Italy by Ruspa, only the finest leathers are used and all stitching is flawless. This is the same leather company that serves Ferrari. The emblems are also made in Italy by Ragni of Torino who make the badges and emblems on Ferraris. This leather smells wonderful and just putting the large bag in your car will give your interior a rich leather fragrance. 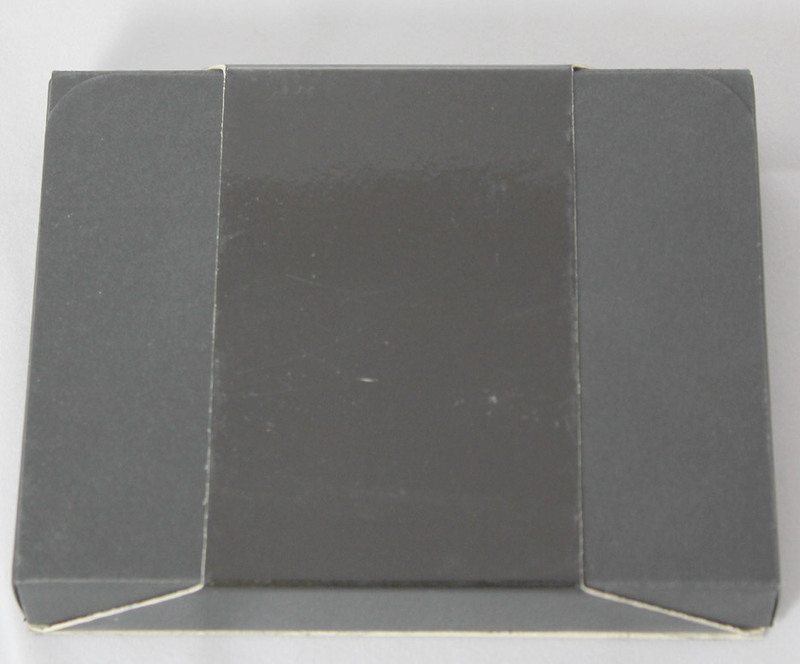 These items are not available anywhere else and only a small quantity were ever made. When you see Tom Tjaarda in Monterey, have him autograph them for your Pantera memorabilia collection. 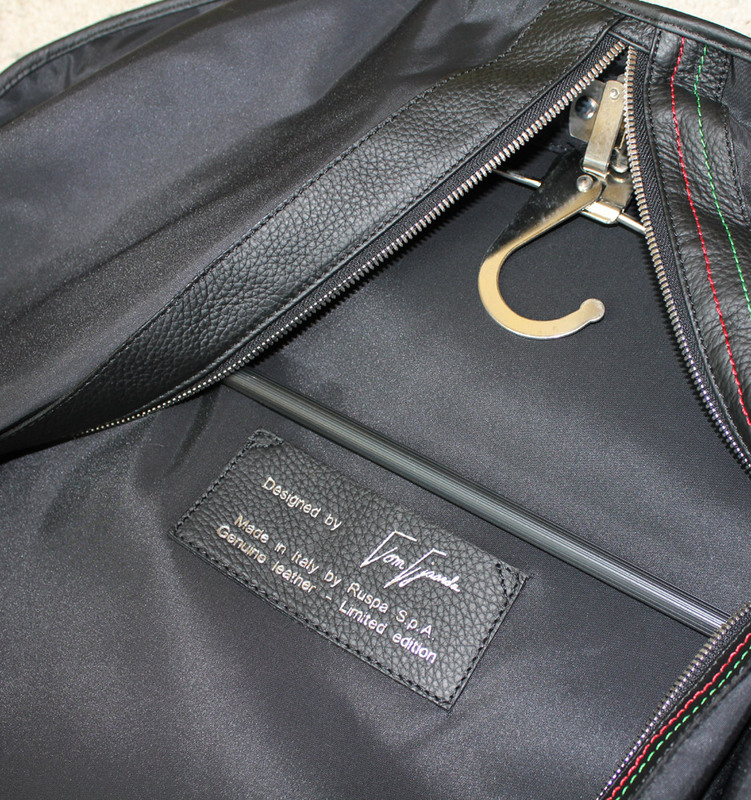 The garment bag is $150.00. 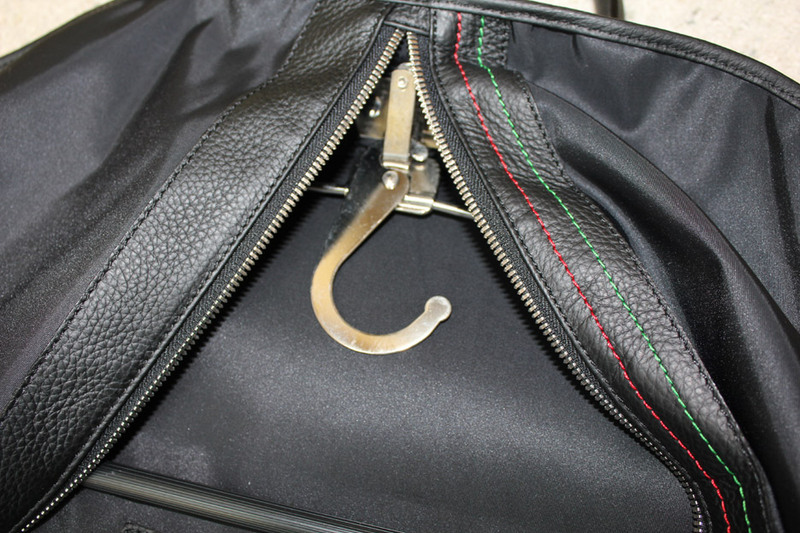 Perfect for carrying your hanging clothing in your Pantera's trunk compartment. 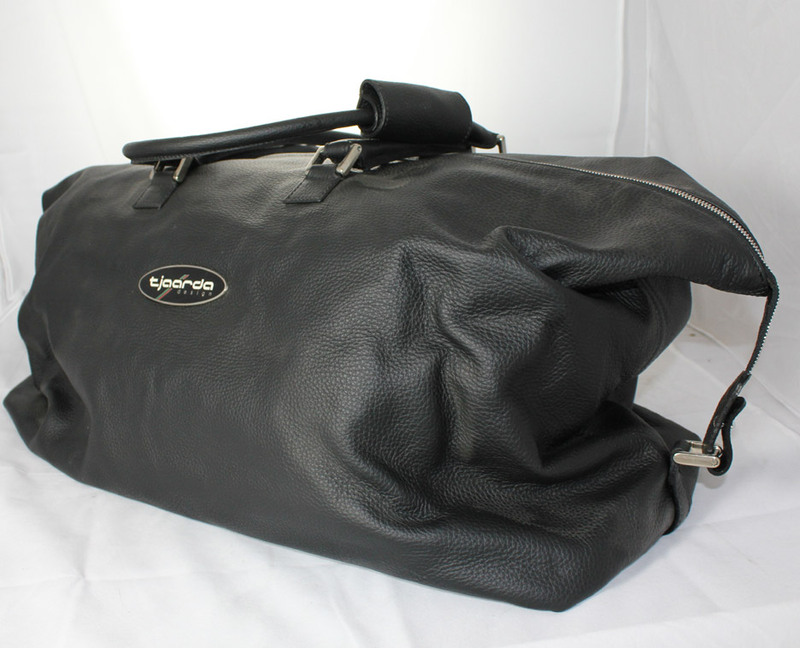 Designed to fit in the front or rear trunk compartment or even on the passenger-side floor is this luxurious, soft-leather carry-on bag or valise. 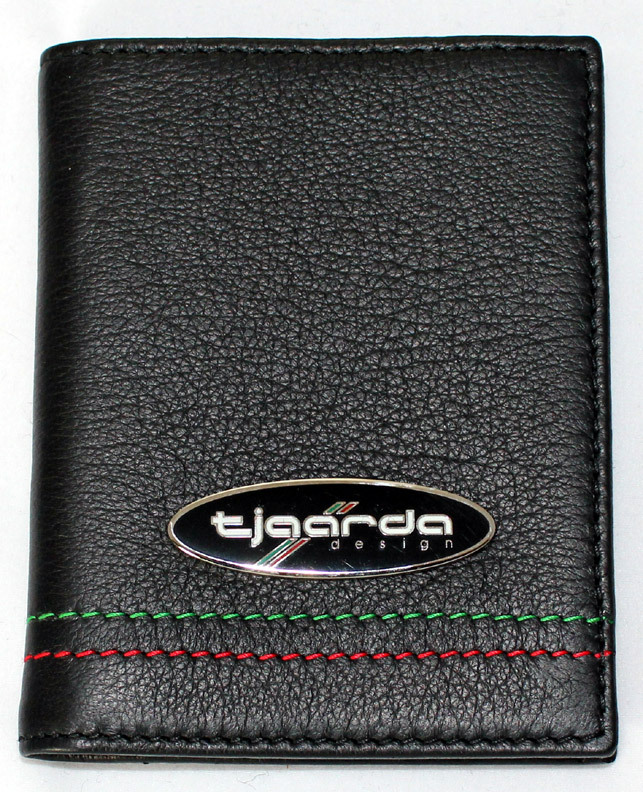 The large Tjaarda Design emblem let's everybody know that you have a exclusive designer-item. 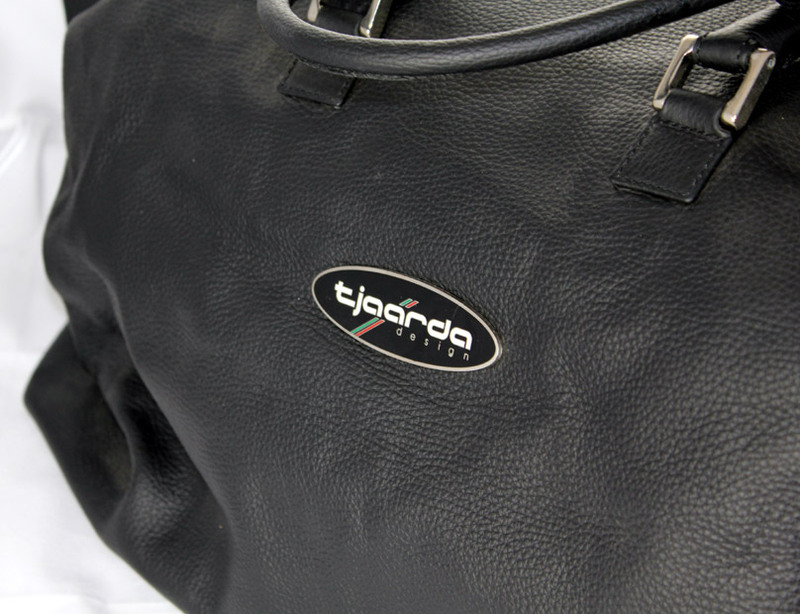 Auto Enthusiasts will recognize the Tjaarda name and the exclusive company that appreciate Tom's artistry, now rendered in supple leather. 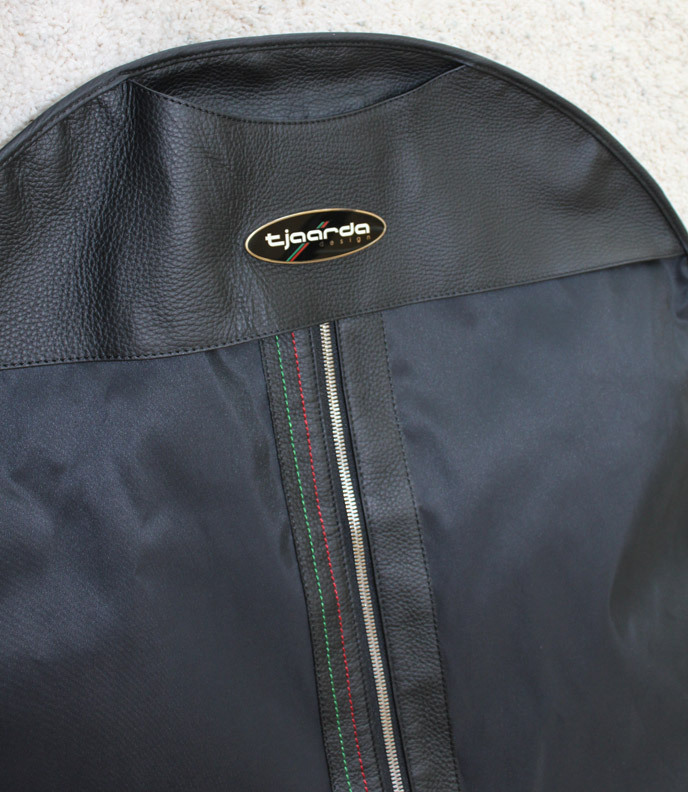 Holds a lot and perfect for touring in your Pantera. $175.00. 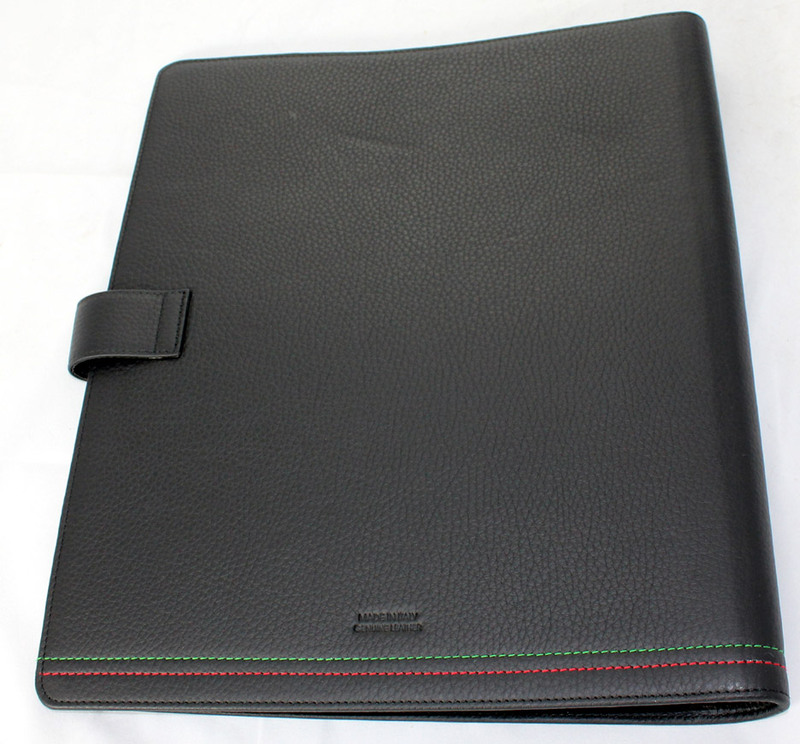 A total touch of class is this amazing leather notebook. 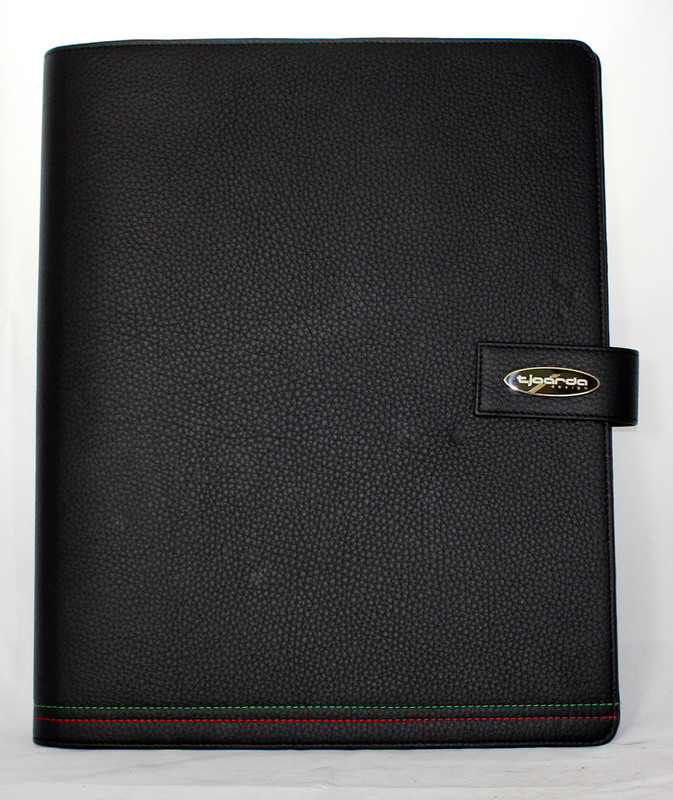 Unlike anything you probably have ever owned, this notebook can hold a legal-sized pad of paper and other items. Lay this item out on the conference table and you will command respect while letting people in the know, know that you bring your automotive passion with you on the job. 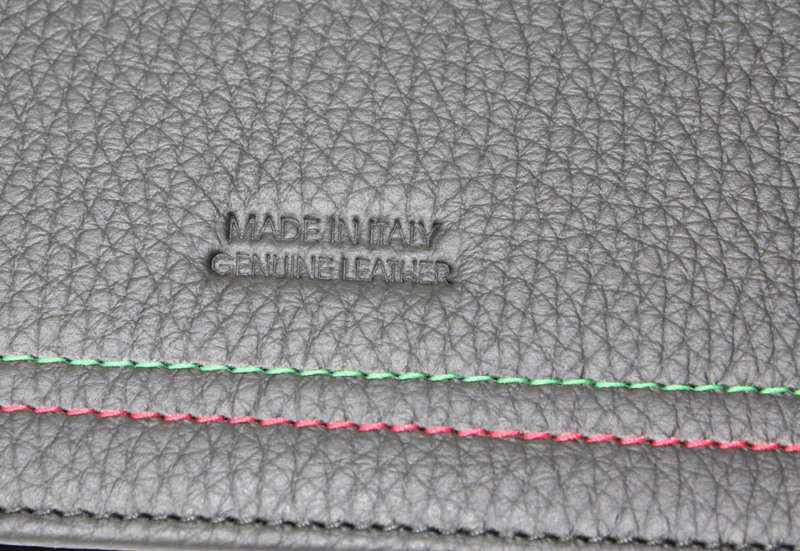 Check out the perfect stitching on the leather. Quality like this is hard to find. Price: $95.00. 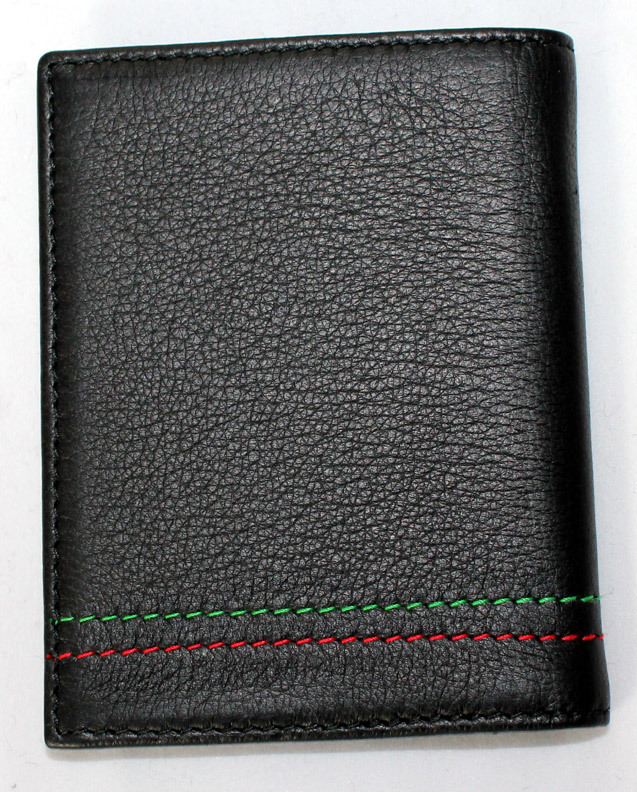 This is a small wallet that uses the same incredible leather and stitching. 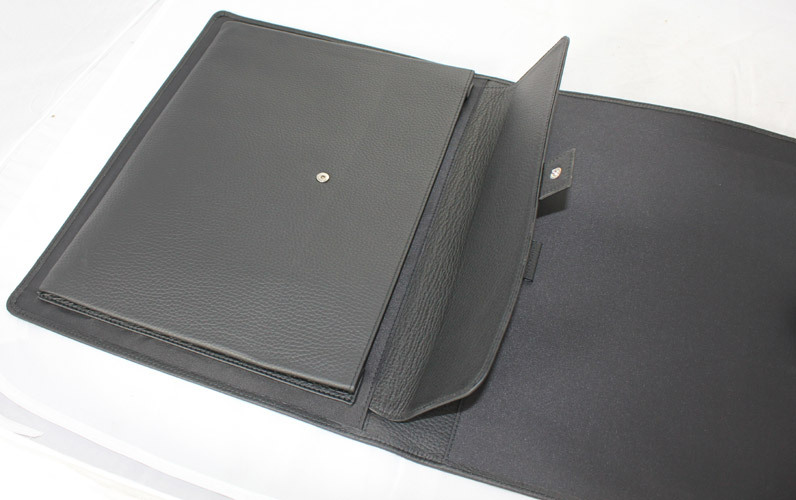 It holds your license, a few pictures and credit cards. It is for traveling light. 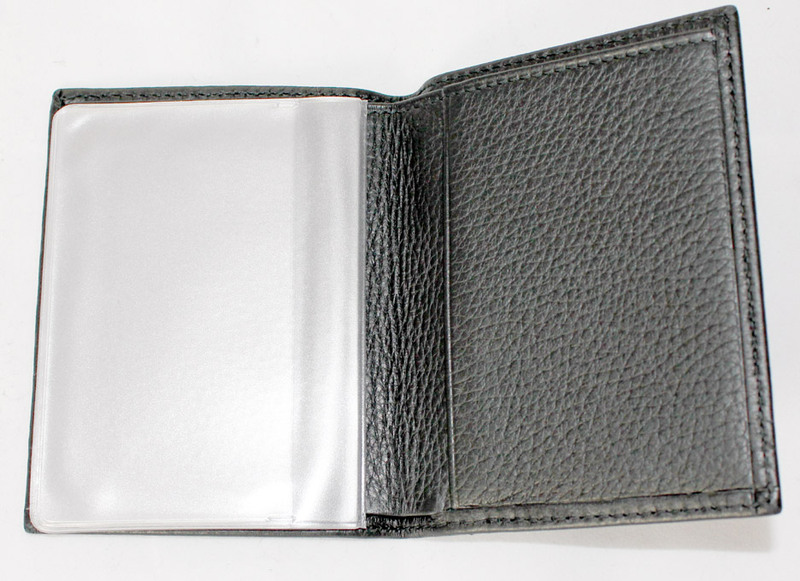 A quality made item, this wallet offers a touch of class at a reasonable price considering the content and exclusivity. 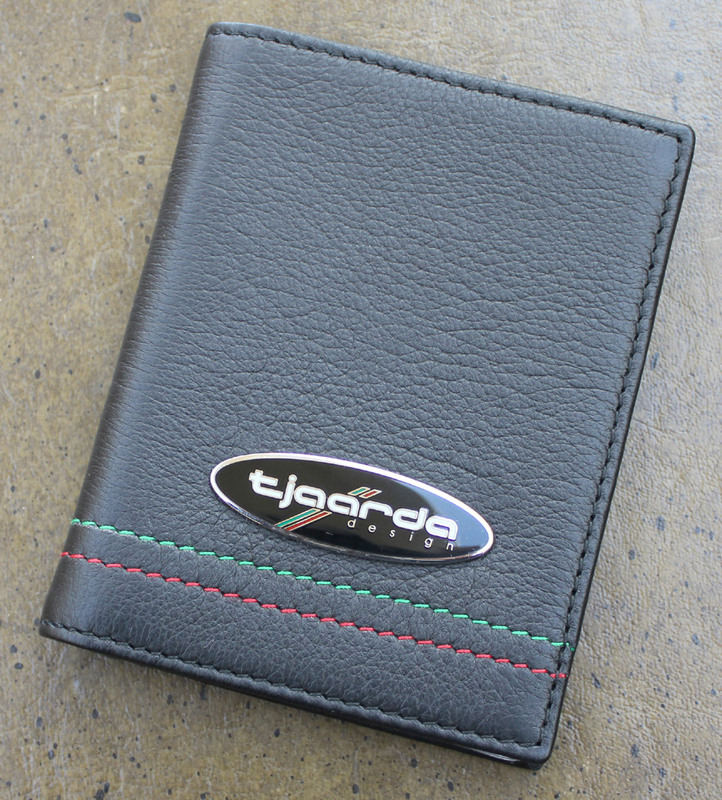 A perfect gift item for the DeTomaso - Tom Tjaarda fan. It comes in a unique package as shown: $75.00. These all-metal and porcelain emblems have two tangs on the backside that will allow you to attach them to your car or selected surface.